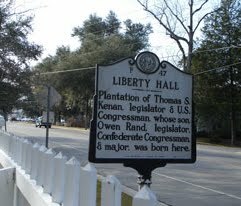 Thomas Stephen Kenan was the son of Revolutionary War General James Kenan, a plantation owner and builder of the first "Liberty Hall". He was a U.S. Congressman from North Carolina between 1805 and 1811. Born in Kenansville, North Carolina, Kenan was educated by private tutors at home. He married Mary Rand Kenan on January 3, 1800, and soon after the second Liberty Hall was built located in Kenansville after his father's home had been lost to fire. Kenan was a member of the North Carolina House of Commons representing Duplin County from 1798 to 1799. Between 1799 and 1803 he served in the North Carolina Senate in 1804. In 1804, Kenan was elected to the 9th United States Congress and was reelected to terms in the 10th and 11th Congresses. He did not stand for reelection in 1810. He and Mary Rand had ten children and in March 1811 Thomas decided to move the family to Selma, Alabama, to start a new plantation. Thomas left behind his oldest son Owen Rand Kenan to look after the Liberty Hall Plantation and start his own family. While in Alabama, Thomas served as an Alabama State Representative.